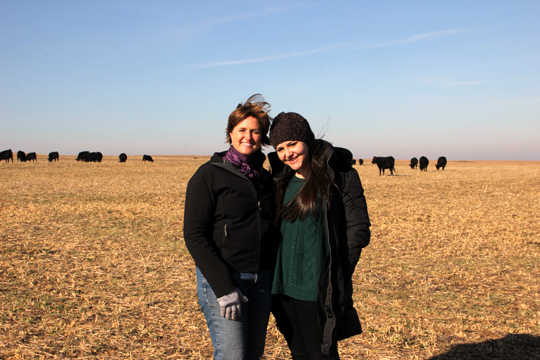 Kids, Cows and Grass: My ranch hosted Rebecca, a viewer from Anderson Live! My ranch hosted Rebecca, a viewer from Anderson Live! People are pretty similar no matter where they live. Yeah, so I'm a cattle rancher in Kansas, but I have a lot in common with people in New York! Seriously!! Rebecca and I pose in front of the cattle in one of my pastures...we're trying not to seem too cold! Recently, I had the opportunity to host a young lady from New York City on my ranch to answer her questions about how beef is raised. I jumped at the chance to directly connect with a member of the audience I try to reach. This all came about through a partnership that the US Farmers & Ranchers Alliance has with the Anderson Live talk show. The show offers viewers the opportunity to submit questions about how food is raised and a winner is selected. That viewer, along with a camera crew, is taken to a farm or ranch where they have the opportunity to ask their questions face-to-face and see firsthand how their food is raised. The recent viewer winner was Rebecca from NYC who wanted to know about the safety of beef in the grocery store and how and why antibiotics and hormones are used to raise beef. She arrived at my ranch on a cold early winter morning and we talked about how the day would be organized and what she was going to be able to see on my Kansas ranch. When we stepped out of the pickup truck, with the cameras running, Rebecca started off right away! Answering questions involves LISTENING as much as TALKING. "Do you use antibiotics on your ranch?" "How and why do you use hormones?" "What do your cattle eat?" "What kind of beef do you feed your family?" "What should I look for in the grocery store meat case?" Wow...she didn't pull any punches! But what a great opportunity to talk with her about the safety of beef in the grocery store. We talked about how we do use antibiotics occasionally to treat bacterial infections in cattle--but it does not make sense to feed it every day. I was able to explain about the hormone implants that are used in cattle in a feedyard. A tiny pellet the size of a grain of wheat (just larger than a grain of rice) is put under the skin in the ear of the animal that releases a low level of hormones to promote growth--thus making more meat per animal. There are hormones in everything that lives including animals, plants, humans...everything. The increased amount of hormones through the implanted pellet is literally miniscule! Waaaay less than many other everyday foods. Rebecca and I drove the tractor to feed the calves and then we talked about what is mixed in the feed. Rebecca wanted to know what I look for at the store. I explained that it depends on what recipe I'm planning. I said there is no better cut of beef than a good old potroast--you can put it in the crockpot and forget about it all day and come home to a hot, nutritious meal. Then the leftovers can be used for shredded beef tacos, beef casserole or simply barbecue beef. Of course, there is rarely leftovers in my house with all these teenage boys eating! The long and the short of my visit from Rebecca and the crew from Anderson Live, is that I learned a bit more about consumers like her and their desire for answers to their questions; and she learned a bit more about life on a ranch and how beef is raised. We are the the people who raise your beef! When you order a burger or steak in a restaurant, or buy beef at a grocery store, think of us--working to make sure your beef is safe and delicious! I am a typical rancher. Nearly everyone in my area raises beef the same way I do. 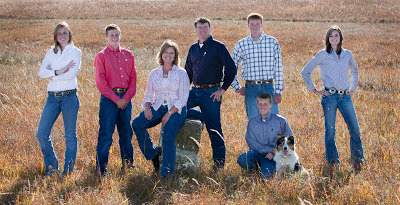 If you wonder about who raises the cattle for the beef in a grocery store or restaurant...just check out my family picture! It is us! We, and thousands of other families just like us, work hard every day to grow a safe, nutritious and delicious supply of beef for ourselves, as well as you! My newest favorite talk show is now Anderson Live...but I'm rarely around a TV in the mornings when it is aired in my neck of the woods. So I plan to set it to DVR and watch it in the evenings. Thank you, Anderson Live, for offering this very valuable opportunity for viewers to see a working farm or ranch firsthand. The more visits you facilitate, the more people will realize that farmers and ranchers are people just like them, working to do their best to raise the world's food. And farmers and ranchers will realize that consumers are not a nameless/faceless entity either! They are real people with valid concerns. We need to be willing to answer their questions in a direct and honest way. I challenge every farmer or rancher I know to host a consumer on their place! And, of course, I challenge every person who doesn't live near a rural area but who may have questions about who is raising their food, to ask a real farmer or rancher. Thank you so much, Rebecca, for traveling to my ranch and asking honest questions. And thank you, Anderson Live, for facilitating her visit and featuring her on your program! What a great post! I've yet to watch the Anderson Show, but what a fantastic opportunity to show Americans where their food comes from! Thanks, Jen! I think the more conversations we have, the more good information will be spread around. There will always be sensationalism, but there should also be enough farmers and ranchers talking about what they do that we can have good discussions about our food! Very nice Debbie, keep up the great work as a beef ambassador. This is awesome!! What a neat opportunity to be an agvocate!! Thanks Debbie! What a treat to see you/hear you speak in Norfolk NE at the Ag-Ceptional Women's Conference and then read about this visit through USFRA on facebook!!! I was sitting next to you in one of the breakout sessions at the conference and you were giving me tips about using my iphone! Thanks for opening up your home to educate others!